Eurocom has launched the 13.3” M4 high-performance, upgradeable, ultraportable laptop, now with NVIDIA GeForce GTX 960M graphics, Intel Core i7-4940MX upgradeable processors and QHD+ 3200-by-1800 13.3” display while only weighing 2 kg. “The EUROCOM M4 is the culmination of all of our experience in putting the most powerful computer components in the world into small form factor laptops. The M4 is a very slight 13.3” ultraportable but has the power of a mobile supercomputer.” Mark Bialic, Eurocom President. Customers now have the option of choosing between three levels graphics technology in the M4, the NVIDIA GeForce GTX 960M, 860M and 765M. This gives customers the ability to choose the perfect graphics performance for their needs. The NVIDIA GeForce GTX 960M GPU provides a potent combination of immersive features and performance for all your games, applications, and entertainment; while also providing intelligent power features to extend battery life. “The EUROCOM M4 offers a very compelling combination of ultra-portability, hgh performance graphics, processors and memory and an ultra-crisp 3200x1800 QHD+ display. For those on the go that require high performance, the EUROCOM M4 is the best choice.” Mark Bialic, EUROCOM President. Powered by a full line of 4th Generation Intel Core i7 processors utilizing the Intel HM87 Express Chipset including the Intel Core i7-4940MX Processor Extreme with 4 cores and 8 threads running at 3.1 GHz (up to 4 GHz max turbo frequency) with 8 MB L3 cache. Up to 16 GB DDR3-1866 SODIMM memory is supported via two slots with 8 GB modules that are easy to access, upgrade or replace. A great computing experience is all about great visuals, the M4 does not disappoint with a choice between three beautiful 13.3” 3200x1800 QHD+, 2560x1440 Quad HD matte and 1920x1080 Full HD matte displays powered by powerful NVIDIA GeForce GTX 960M graphics. 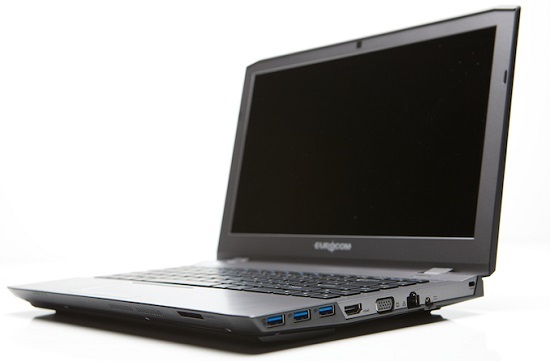 The EUROCOM M4 offers shocking performance, buttery smooth frame rates, a long 300 minutes of battery life and ultra-portability. A perfect fit for those who want to conquer today’s mobile world. Performance comes by way of NVIDIA GeForce GTX graphics and optional Intel Core i7 processors up to i7-4940MX Extreme, up to 16 GB DD3-1600 memory and up to 4 TB storage with 2 mSATA SSDs and one 9.5 mm storage drive bay.